Struggling to learn how to code? If you’re looking to 'learn how to code' and seeking a career as an expert-level programmer, you should know how to play with codes and make your own. It's no secret that mastering a coding language or two can put you at the top of the job market – thanks to the boom in technology. Today, you can elevate your programming skills straight from the Internet to become an actual coder, but getting into a heavy subject like coding involves a lot of time and money. 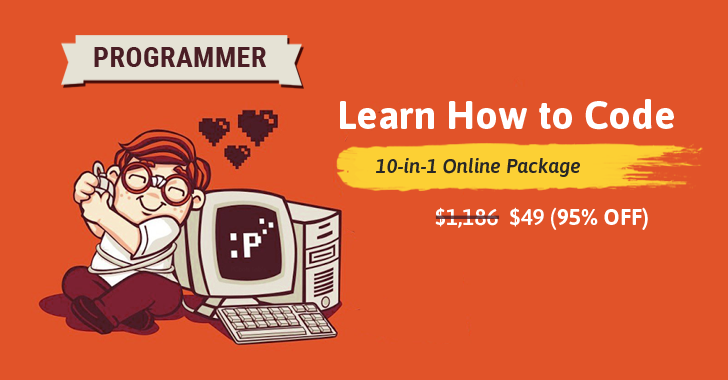 Fortunately for you, this week's THN Deal Store brings the Ultimate Learn to Code 2017 Bundle that gives you access to 10 online training courses in 1 single account at just $49, instead of $1,186. This 95% discount is valid for next few days. The Ultimate Learn to Code 2017 Bundle, comes with lifetime access, offers you professional training courses on Python, Ruby, Java, iOS, HTML, CSS, AngularJS and other programming languages that are in high demands, that users can browse through desktop or mobile. How to Join this Training Course? All these impressive courses come in a single package, Ultimate Learn to Code 2017 Bundle, which is available at just $39 (95% discount valid for next few days) at the THN Deals Store. So, what you are waiting for? Sign up your account here, click ‘Add to Cart’ and grab the exclusive discounted deal NOW! Let's dig deeper. Here below we have elaborated each course for our interested readers. HTML and CSS are two essential programming languages for building and designing websites. With these two languages, you will have the skills to create professional as well as responsive websites that clients and users will love. Even if your goal is not to become a web-designer, learning HTML and CSS is an essential step to getting into Information Technology domain. In this course, you’ll have access to 57 video lectures that will help you learn the basics of HTML and CSS, how to approach page layout, and create responsive websites with practical examples. Python is a powerful general-purpose, an easy to learn, versatile programming language, which is not just limited to web development, you can use it to analyze data, build games, and more. Python has rapidly become popular among Hackers, Reverse engineers, software testers, Forensic analyst and Penetration testers, as most Python programs run on all the key operating systems including Windows, Linux, Mac, and more. In short, if you are a beginner, Python is perfect language to start with. With this course, you'll have access to 76 video lectures that will take you through the basics of Python, help you scale up your knowledge and prepare you to build a wide variety of applications using Python. So, you want to program in Java? That's good; this course includes 69 video lectures that are fast, easy, and efficient. Developed by Sun Microsystems in 1995, Java is among the most popular high-level programming languages out there and is one of the highest paying programming languages on earth. Java runs on a variety of platforms, such as Windows, Mac OS, and Linux and can be used to develop different types of cross-platform applications, including desktop software, mobile applications, and large systems development. Regardless of your coding experience, you can become an expert with the help of this course, which will take you all the way through basics to advanced concepts, covering all the core concepts you need to know to become a productive Java developer. Ruby on Rails is an open source, easy-to-use and extremely productive web development framework written in Ruby. Some of the top sites are using Ruby on Rails to build backend of their websites and apps, such as Twitter, Shopify, Airbnb, Github, LivingSocial, Hulu, Groupon and Yellow Pages. If you want to create highly functional and robust web apps in the shortest possible time with the least possible pain, Ruby on Rails is an excellent choice. This course is giving you an in-depth tutorial on Ruby on Rails with 167 video lectures, designed for students of all levels and backgrounds. You can learn some of the newest features, including building real-time apps, and master advanced development techniques. Angular 2 is the next big thing. It is one of the leading frameworks for building modern, scalable, cross-platform applications. If you are seeking a career as a front-end or a full-stack developer, you need to learn Angular 2. Approved by Google Developer Expert Todd Motto, this Angular 2 with TypeScript for Beginners Guide will help you build real-world apps with Angular and master the core Angular 2. Do you want to create iPhone iOS 10 apps but have little or no programming experience? Then this is the perfect course for you! An average iOS developer makes about $90,000 per year, and you too can be part of them. All you need is this ultimate iOS 10 & Objective-C: Complete Developer Course that will give you everything you need to start your new career in iOS 10 development. This online course will teach you how to create iOS 10 apps in Xcode 8 and Objective-C, from concept to submission to the App Store. To help you understand the process of building applications within Objective-C, this course will let you create over 20 real iOS 10 apps, ranging from fun and simple games to powerful utility apps using the native features of iPhones and iPads. SQL Server is one of most popular database programming language in the world today, also known as Microsoft’s enterprise database management system. Learning SQL is one of the best and fastest ways to improve your career prospects, as SQL is one of the most in-demand tech skills by many Fortune 500 companies and startups of all sizes across the globe. SQL Server training is available online with a total of 35 video lectures that will help you learn the fundamentals of ASP.NET, IIS, and Visual Studio, writing SQL to perform a variety of data manipulations, as well as implement and manage database solutions. Xamarin is pretty amazing mobile app development framework that allows developers to create cross-platform native applications for Android, iOS and Windows Phone. To make the same app for both Android and iOS, you don't need to learn both Java and Swift. Xamarin lets you use the C# programming language to build fully-functional apps for both iOS and Android at the same time. This online video training course includes 48 lectures that will help you to learn mobile applications development from zero to deployment with in-depth guides.